Water, water and a bit more water! It’ all go in the veggie patch! I’m Hannah, and this is my very first blog. Both my fiancé and I have had a life long dream of living a rural life, owning some land and keeping animals. This blog will charter our adventure as we make this dream a reality. When my fiancé and I first thought about moving our imagination went wild. We knew we wanted some land, a character home and somewhere we could make our own little bit of paradise. We set about scanning the internet for suitable properties and soon had hundreds on our list. Location was key, as my fiancé still planned to work in his current role so good transport links were vital. We started looking at South Wales and on our first trip we fell in love with the beautiful countryside. After several weekends spent driving to Wales and looking at properties, arguing about the suitability of properties and how they might work us, we finally found Morganwg. Nestled in a small valley, on the side of a hill, sits a small white stone and slate cottage on the edge of a small woodland. 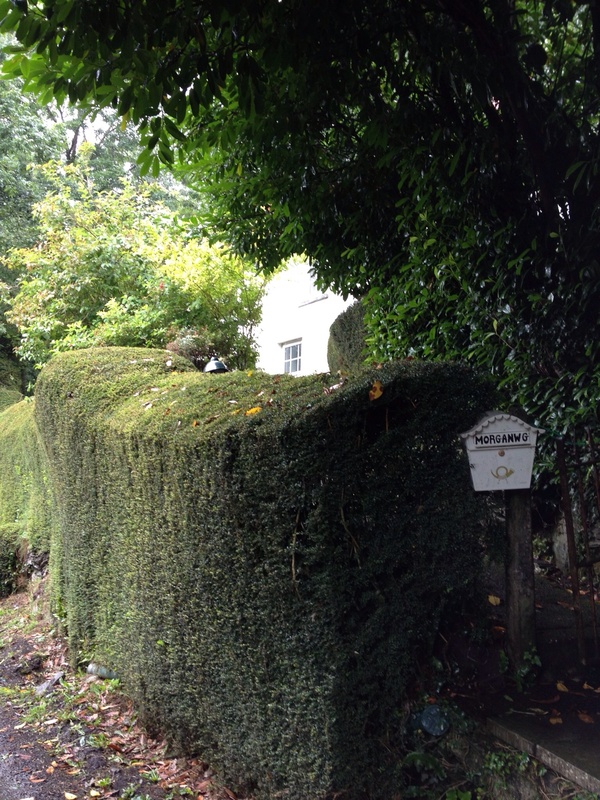 A tall, well manicured hedge hides the cottage from the lane, so you only catch a glimpse of it as you drive by. Walking up the path from the road for the first time was like finding hidden treasure and as we wandered around the cottage our imagination kicked in. We fell in love with it, despite the obvious damp and copious amounts of work that needed doing. We then ventured into the wood, well I say ventured, but it was more ‘peer’ as it was so overgrown we couldn’t get very deep into it, but again we felt like kids and our imagination was off again. We were then shown the two fields across the road and wandered around thinking where’s the catch? At the bottom of the fields runs a stream where trees grow on the far bank, it’s a magical place. Butterflies were abundant, birds were singing their little hearts out and it was so very peaceful. we knew this was the dream. After several months moving day finally arrived. The vans and cars were packed, off we went. It was a damp February day when we arrived at Morganwg. The cottage still looked enchanting, although not quite as magical as that summers day when we first set eyes on it. When we arrived the removal men were already unloading and it was very frantic. The front door had to be forced open as it had swelled so much from the damp. It took us nearly a week before we could close it fully! Unpacking our belongings was quite scary, as it was all becoming a reality – what if we’d made a horrible mistake? Our first task in between directing the removal men and unpacking was to get the fires lit – the damp and cold inside the cottage was almost unbearable. We finally got rid of the removal men and had a fire going so it was relatively warm in the lounge – the rest of the house would have to stay cold for now. I remember waking on the first morning, the bedding was damp, I was chilled to the bone, thinking we have made the worst mistake of our lives. Luckily, as time has gone on and the days have gotten longer, the house is now slowly drying out and I’ve fallen back in love with the cottage. I listen out every morning for the woodpecker on the bird feeder, collect kindling from the wood – our wood, and I wander down to the stream and watch the water rippling over the slate and marvel at just how very lucky we are. Every day is an adventure in our very own playground and although we have a big mountain to climb to make it the little oasis we imagined it to be, we will get there and this blog will share our journey. Hi Lisa, welcome to my blog. I hope you enjoy it. Just look at her frills! After five years of owning a weather vane, we finally managed to get it set up! Russel came with us to find more bluebells in our wood. There are more and more each year and deep in the wood, their scent fills the air. I’m so excited, the tree peony we inherited has eleven flower buds! I’ve been trying to tame it since we moved here as it was about six foot tall and very unsightly. It’s not flowered for three years and I’ve been threatening to move it as it’s in totally the wrong place. Finally my patience has paid off and this year it looks stunning. These flowers are the size of dinner plates! It’s going to be beautiful.